By popular demand we've created another installment of "Mayan Ingenuity". This time we're focusing on "Hacks for the House". Check out our previous post here. It's important to note that the term "hacks" is not meant in a derogatory way. If you look at these examples of armchair engineering with an open mind they can be brilliant in their simplicity and inspire creative thinking. Poverty encourages reuse, and reuse can spur creativity. Here are a few examples. Mud bricked buildings. The top pic is from a house in town, the lower pic is of the outer wall of our kid's school. Mud bricked buildings are not the norm here but they are not hard to find. They are made of earth, water and straw or some other fiber. They are 100% natural, very environmentally friendly, provide fantastic insulation and if cared for properly they can last a lifetime. For more info on how to create and care for mud bricks check out this link. If you don't have a mud brick or cinder block house (a lot of locals don't), and you need to repair a wall any, and I mean any, material coupled with some metal wire or twine will likely do the trick. 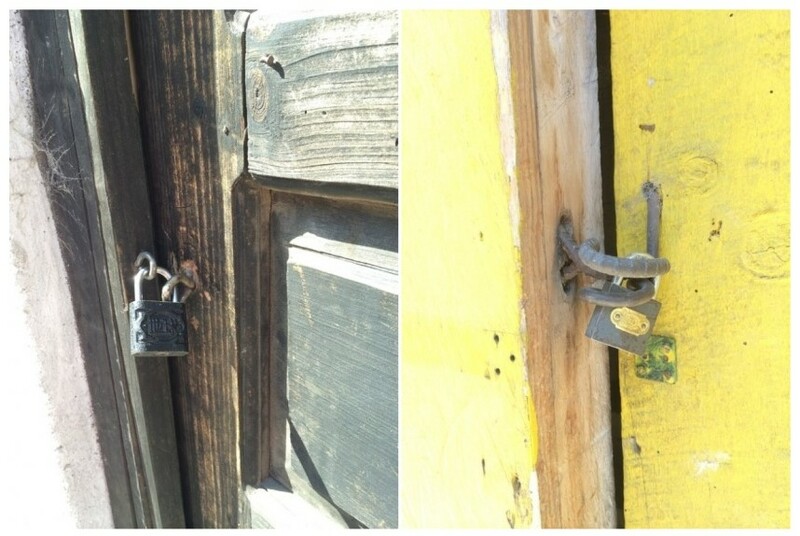 In the event you need to lock your front door but can't invest in a deadbolt, just buy two eye hooks and a pad lock (left picture above). If you'd prefer not to buy eye hooks or perhaps the hardware store was closed, bend some rebar (right picture above). Either will work and the rebar is probably a stronger solution. A little bit of white speaker cable will double nicely as a door handle. If the lock is on the exterior you probably don't need a latching door knob. Drill two holes, run a piece wire through them and you've got a comfortable handle. Get electricity fast with this solution. Let's say you decide to open a tortilla and bean business but need electricity fast. No problem. The electric company can simply tack a meter to an old piece of wood propped up next to your door and you are ready for business. If you have a TV antenna but no pole a piece of bamboo will work nicely. Innovative recycling coupled with cable TV. 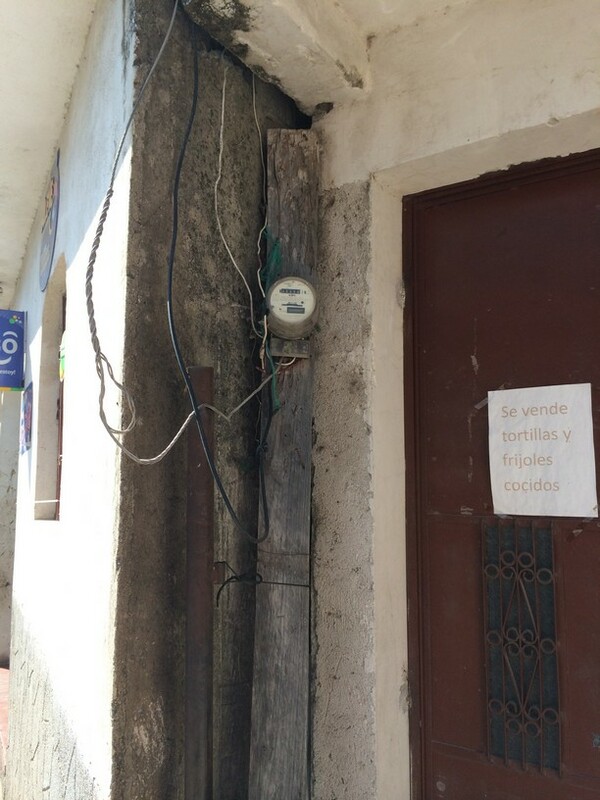 If you live in the Lake Atitlan region and have cable TV, yes it does exist here, there's a good chance that somewhere between your house/apartment and the street there is a used plastic Gatorade or Coke bottle providing weather protection where two cables join or where a splitter exists. Perhaps you have a chain linked fence but determined it is not tall enough. No problem, and no need to dig up the old posts to put new ones in. Buy some wood to mount on the existing posts. Secure them with metal wiring. Buy some new chain link and mount it to the new wood extensions. 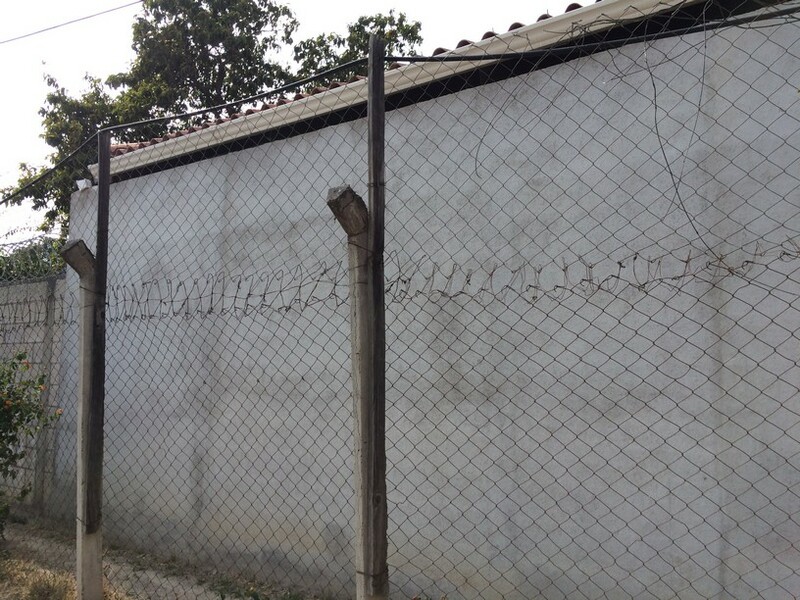 Tie the two fences together with more metal wiring. Boom, done! Secure your roof with ease. Looking for a budget way to replace your roof? Consider doing it without nails. 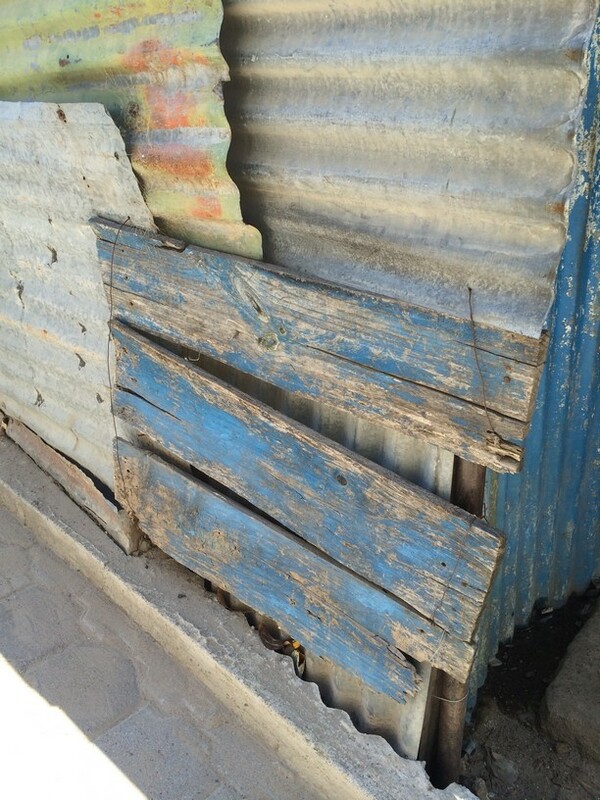 Buy the roof (made out of corrugated metal), lay it down on cross beams and secure it with rocks or wood. Anything heavy. And because you are not piercing it with nails, screws, rivets, etc. you're not creating holes. The above picture is showing a storefront having their overhang extended. 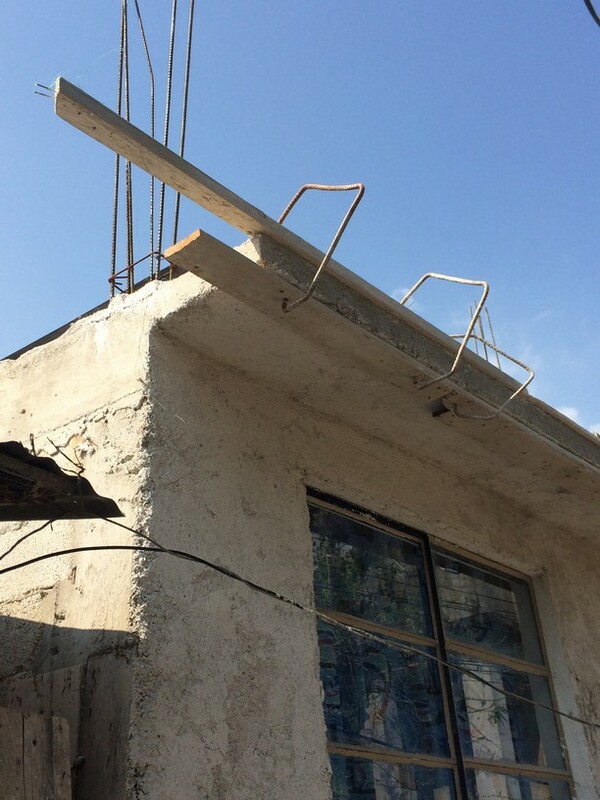 Two men worked on makeshift scaffolding to add the new cement to the existing overhang. To secure the final extension they used bent rebar to apply pressure to hold the wooden mold in place. Genius. The end product looks great and the workers saved a lot of money not buying traditional clamps. There is no end to the usefulness of PVC here. In the above example it's used as a makeshift gutter over a doorway. Why get excessively dumped on when leaving your house when you don't have to? All of these solutions are all natural in comparison to modern alternatives. It's a great reminder everyday of how you can do more with less, and it's great to point these out to our kids.